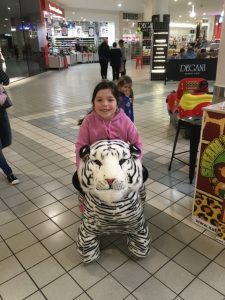 Safari Kids Animal Rides takes shopping to a whole new fun experience. Parents and kids can rent our premium ride on animals for a period of time and enjoy the best unique shopping experience there is. For parents with little ones under 6yrs old, we cater for you too. Yes, our animals are strong enough to carry two at once. You can also Hire Us to come to you. We cater to Special Events, Birthday Parties, Grand Openings, Functions. So Hey Kids, what are you waiting for? Get out there, track us down in any one of our current locations because riding Big Safari Animals has never been so much fun!